In recent weeks Boris Johnson has come under increasing pressure to abandon support for a new airport in the Thames Estuary as an alternative to further expansion of Heathrow. 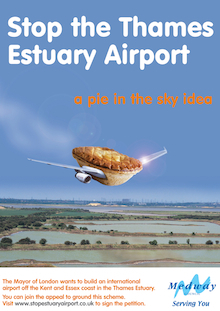 In 2008 the Mayor commissioned Doug Oakervee to conduct a preliminary feasibility study into the possibility of locating a new airport in the Thames Estuary. The scheme is opposed by local councillors, environmental groups and, according to research published by Medway Council, major airlines using Heathrow Airport, including British Airways and Virgin Airlines.